Team Worrall wants to become more Eco friendly this year. As a family we all watched Blue Planet and we are all now terrified to the core about the consequences of plastic in our eco-systems. I’ve been following lots of blogs and researching different products, even products I can make myself so we, as a family, can be more eco friendly and work towards going plastic free. I chose to go for 48 rolls of recycled bamboo 3ply. Cost wise it was an extra £8ish on top of what I regularly pay. There is a subscription option where they automatically charge you and send you a box however often you require. I’m thinking every 2/3 months but I’ll see how we get on. A large cardboard box arrived a few days later, no excess or unnecessary plastic packaging or wrapping just 48 neat toilet rolls in the box. The decorative wraps help protect the toilet paper from absorbing moisture in the air and they are a damn sight prettier than plastic wrap you usually get. I’ll be saving these sheets of paper to do crafting with the boys. Oren was very excited when the box arrived, mainly because he’s clearly learnt that “crap” is a slightly naughty word and thought it was hilarious I let him read it out. It is what it is. We all do it and we should all be able to at least have a laugh when we talk about it. Loki got involved straight away and stacked up the rolls as high as he could. He also spent about twenty minute unwrapping and rewrapping a roll. Total bonus! Now I’m fortunate enough that our bathroom cupboard is large enough to store all 48 rolls but the great thing with these is that they are individually wrapped therefore easier to tuck away into any nooks and crannies you can find! Now the quality is not as thick as my usual loo roll but I wasn’t expecting it to be. It is recycled after all. For its intended purpose I don’t need it be super thick – I just need it to do the job. This stuff will do the job. It doesn’t disintegrate with the first dribble of moisture like the really cheap stuff. It’s pretty robust. It will do just fine. I love that you get 3 Emergency Rolls in red wrapping – you know… just in case of an emergency! They’ll be a great reminder to check our subscription renewal when we get through our stash to the “red” ones anyway! If you’re in need of some light reading material whilst in the bathroom each toilet roll has some information of the benefit of Who Gives A Crap; it really is good for your bum and great for the world! 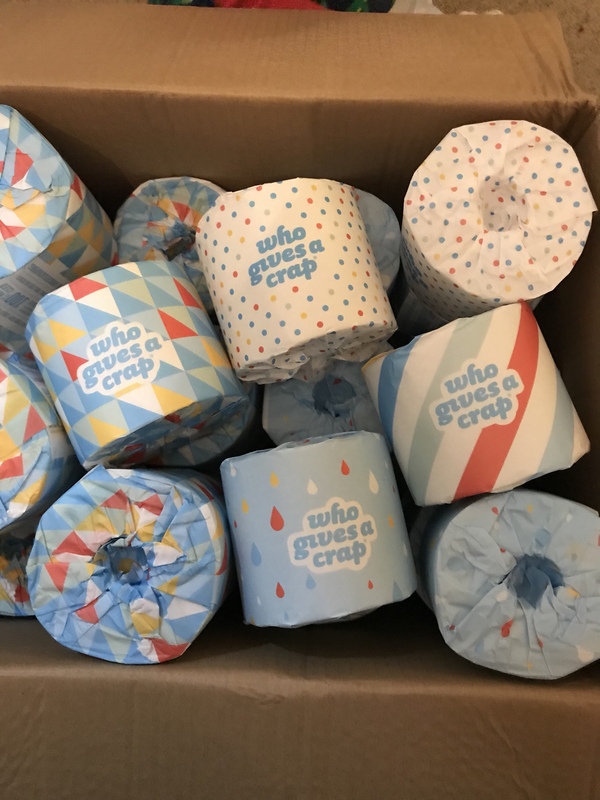 A whopping 50% of the profits from Who Gives A Crap go straight to WaterAid to help build toilets and improve sanitation in developing countries. I am happy to donate to charity (as it were) with every purchase of a box of toilet rolls. The rolls themselves are bigger than the usual too. 4 out of the 5 of us use toilet paper and we usually go through a roll every 2/3 days. I put a WGAC roll in the bathroom on Saturday morning and it’s not even half done… 5 whole days – including a weekend and it’s still going! I’m genuinely amazed! I think overall the small price increase isn’t even going to count as you’re getting more for your money! Masses amounts of plastic saved from landfill and a charitable donation made too. Definitely a win in my book. January has been a fab start to the year on the eco front, let’s hope February continues on the same path! Hopefully save a few pennies whilst still donating to charity! Win win!